We have another chalet in the pipeline – Chalet Samoens – located right in the centre of Samoens town. Click here to go to Chalet Samoen’s listing page. Chalet Samoens (yes we know it’s an unoriginal name) has 6 ensuite bedrooms and is quite possibly our most luxurious chalet yet. The ski chalet is currently under construction by the No 1. development company in the region. Chalet Samoens will be completed by the end of October at which stage we will add photos to the website. We have just started taking reservations for winter 2014/15 – because there are no pictures of the chalet we are offering lower rates than we will from winter 2015/16 onwards, so this winter is your chance to grab a luxury ski holiday at a discounted rate! Our new ski chalet in Samoens could not be in a better location – Chalet Samoens is situated about 300 metres from the medieval town square and just 150 metres from the free ski bus route. This bus runs throughout the day, taking you directly to the Grand Massif Express where you can access all 265km of pisted slopes in Le Grand Massif mountain range. Despite being located in the centre of town, Chalet Samoens is in a quiet spot down a side road. All the bars and restaurants in Samoens are all within a couple of minutes walk. 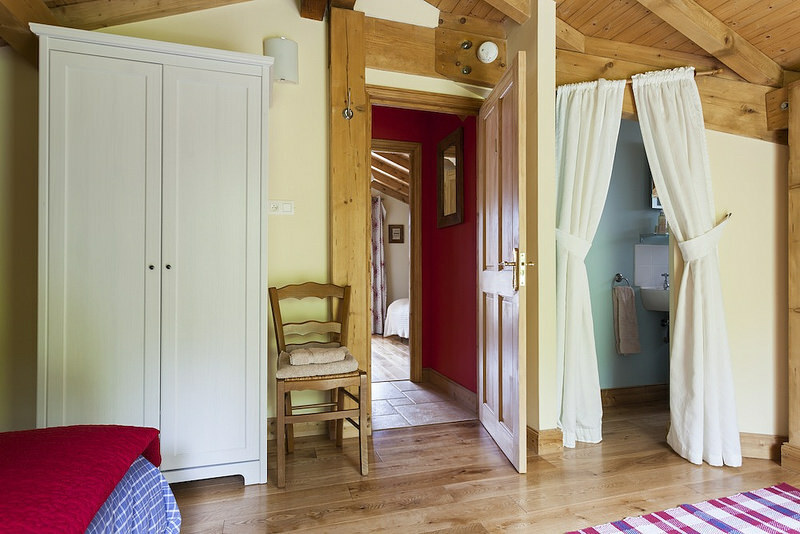 Chalet Samoens has 6 ensuite bedrooms. 3 of the rooms are very big meaning that the chalet can sleep a total of 17 people, however we can accept exclusive occupancy bookings for smaller groups. The ski chalet is accessed by it’s own private lift. The first thing to notice as you enter the ski chalet is the large wetroom with both a sauna and jacuzzi. This adds a real touch of luxury to the ski chalet and will be where most of our guests will be found after a day on the slopes. Chalet Samoens has a large open plan living area that is centred around a huge wood burning stove. There are large balconies on the first floor (from the living area) and on the top floor (from Ensuites 3 and 4) offering great views over Samoens town. It’s business as usual at The Tasty Ski Company for the service that is on offer at Chalet Samoens – it is a fully catered chalet meaning that breakfast, afternoon tea and dinner (with wine) are included in the price that you pay. A typical dinner includes some nibbles followed by canapes, starter, main course, pudding and finally a cheese course with tea and coffee. Your chef has one night off a week (Wednesday) which gives you the chance to sample one of Samoen’s many restaurants. Click here for our quick guide to Samoens restaurants. At The Tasty Ski Company we also offer a comprehensive pre-arrival service to help you with ski lessons, ski hire, ski passes and airport transfers. We can be paid in pounds sterling meaning that you will not have to pay any expensive foreign exchange fees. So we hope you like the look of our new luxury ski chalet in Samoens – stay tuned for the pictures in October!